Prestbury URC celebrates 145 years! We are drawing ever closer to Good Friday, the day when I expect that this hymn will be sung in most of our churches. We have journeyed through the weeks of Lent, making that journey together in our times of worship, our times of shared prayer, our times of study together. We have also made that journey as individuals, as disciples of Christ, moving through this Lenten period on our own personal journey of faith. Perhaps we have been able to make a little extra time for God. Perhaps we have been able to keep up with our Lenten discipline – whatever it was that we set out to do back in March, on Ash Wednesday, when we set out with such optimism. Possibly we have failed – I know I have – and have tried to pick ourselves up and get ourselves back on track, probably with less success than we would like! The Cross is such a major focus for us during these weeks; that is why we put up an extra one (the Christmas tree cross) in some of the churches. It is also why we cover other crosses with veils: to emphasise its significance. As we move into Holy Week, we go in spirit to Jerusalem, to accompany Jesus through the final days of his life. We speak of ‘walking with him’ on the way of the cross, becoming more and more aware of the enormous burden which he carried for us. We tell ourselves that the times when he falls under the weight of that burden are like the times when we have fallen from our Lenten discipline. Yet we know that he will pick himself up again and carry on, moving ever closer towards the place of execution. The time when ‘the wondrous cross’ will become for us ‘the tree of life’. As I write this, on the 2nd Sunday of Lent, Good Friday still seems some way off but the cross has definitely become the strong focus of my Lent journey. This has been a journey dominated by two world news stories: the earthquake and tsunami in Japan and the conflict in Libya. Both situations inevitably raise many questions, not least the questions that we hardly dare form, such as ‘where was God?’ and ‘why has God let this happen?’ We are perhaps afraid to voice them because they challenge our faith, which can feel vulnerable and shaky at the best of times. Now we see the pictures and hear or read about the heart-wrenching stories and we almost want to cry out, like Jesus, ‘my God, my God, why have you forsaken me?’ And yet, it is in the very act of making that cry that we turn back to God. We turn to Him for reassurance. We are drawn back to the cross, from which Jesus made that cry, and what we see, on that wondrous cross, is love. Pure, unquestioning and unending love. As the hymn concludes, ‘Love so amazing, so divine, demands my soul, my life, my all’. I was most grateful to Fr Michael and Fr Daniel for allowing me to preside at the Eucharist on the 50th anniversary of my Ordination to the Priesthood which took place in St Mary’s on February 26th, 1961, and to celebrate the Eucharist again on the following day, being the anniversary of my first Eucharist. At the services I explained that Fr Norman Kent, the Vicar, had slipped in the churchyard and broken his ankle and it proved difficult to find priests to take the daily Eucharists. There were few active retired priests and NSMs were beings of the future, so the Bishop agreed to bring my Ordination forward. I have to say that I was overwhelmed by the number of people who attended the Saturday Eucharist as well as the numerous cards and good wishes which were quite unanticipated. One of the delightful features was the number of people present on the Saturday and Sunday who were at the Ordination in 1961, all of us looking (ahem!) somewhat older! It all made a most memorable weekend. Thank you. On Saturday 26th February, about twenty of us gathered at the altar at St Mary’s Church to celebrate with Fr John Lewis the fiftieth anniversary of his ordination to the Priesthood. It was a little emotional for me personally because I was at Fr John’s ordination service. I was privileged to have been at Fr John’s 40th anniversary celebrations – so here’s to the Diamond! With our love and best wishes. During the weekend of 21st-22nd May Prestbury URC will be celebrating their 145th anniversary with exhibitions, open afternoons and a special service. On Saturday from 1pm to 5pm and on Sunday from 2pm to 5pm the church will be open as part of the ‘Cotswold Churches Festival’. Inside there will an exhibition of church records, memorabilia and old photographs and the new Prestbury Local History Society will be in attendance. On Sunday there will be a special anniversary service at 10.30am which will be led by the Revd Maz Allen, but the preacher will be one of our previous ministers, the Revd Glyn Jenkins. Afterwards there will be a celebratory lunch for our members and invited guests. On both days we will be serving afternoon teas so we hope that as many of our friends from St Mary’s and St Nicolas’ as possible will drop in and share in the celebrations. There are small blue ‘penny pots’ in a basket on the table in St Mary’s and in St Nicolas’ vestibule. Please take an empty pot, fill it with pennies or other coins, and return to Sheila at St Mary’s, or Gillian Jackson at St Nicolas’, who will send the money to the Cobalt Unit. So far we have donated £301.17 in this way. Thank you all. I did not expect anything except good company when I went to Professor Andrew Lincoln’s talk on 13th February. I didn’t have any expectations of what the talk would be like, I just thought I would go and see what was happening in the church next door. I want to start with the end because the end of the talk tells you a lot about what is to follow when you listen to it. When questions were asked for there was silence. Deep truths had been uncovered, and as I listened to people during coffee they were buzzing about how to formulate their questions, so lack of ammunition was not the reason. Something had stirred in the depths, I suspect for each one of us. Stillness is the beginning of a question that grapples, the first step of an important search. If you want to see what caused the stillness you can read Andrew’s talk on this website, but in the meantime I thought it would be useful to share some reflections and start a conversation. Andrew explored with us how ‘Love the Lord your God with all your heart, with all your soul and with all your strength’ (Deut 6:4,5) helped Jesus through his temptation in the wilderness. Reflect on what this means in relation to God’s promises and what it means to trust in God and how we can find both faith and reason to trust in God through the Bible. Can you see how God is working in your life? It is not easy at times but ask to see and watch… For me the easiest way to do this has been to do what Jesuits call a ‘review of the day’. It is what we do naturally before we sleep or when we wake, looking back through the events of the day; try to do it prayerfully seeing where God has been at work. The more we participate in what God is doing in our lives, through living out our baptismal vows, the more we reflect the relationship between the Father and the Son, between God and Jesus. Life gives us ‘wilderness’ time which slows us down, makes us watch where we are going and look closer for the way ahead because it is unfamiliar territory. Together as Church we face unfamiliar ground, an adventure, if we enter it fully; despite the cost of moving into what feels like unknown territory we will grow. All God wants is for us to listen, discover and act. God does not see success and failure in the same way we sometimes do. Strive to be who we are called to be, encourage new growth, and God, I have found, will meet us more than halfway. As part of our provision of daily prayer in Lent, this year there will be a simple service of silent prayer followed by sung Compline at St Mary’s Prestbury on Tuesday evenings. Silent prayer begins at 8.30pm, and Compline will begin at 9.00pm. You are welcome to both or either. Abridged from Robin’s most recent email. As we begin the season of Lent, I pray that for each of you it may be a time of reflection and renewal. It seems like ages ago that I set out on this journey. I remember the excitement of that time, looking forward to the work and getting to know the place and the people, and I am glad to say that my time in Sudan has more than exceeded my expectations. When I started, I agreed to a term of two years with some flexibility, hoping that at the end of that initial period the Agriculture Department, which I was asked to establish, would be ready to stand on its own. I celebrated two years in Sudan at the end of January this year, and I am happy to say that the Agriculture Department of the Episcopal Church of the Sudan is in transition to local leadership and management. My replacement will be hired shortly, and I will be departing Sudan in April, returning home to California. However, my involvement with Sudan and the ECS Agriculture Department will not end in April. I will continue to advise the department and its new leader as I am able by email, and I will return to Sudan late in the year for several weeks to assist with some training programs. Through my travels and work in Sudan I have learned so much about the church’s role in development work. It is quite clear here that being a member of the Body of Christ is not just something you do on Sunday morning. Our calling as Christians touches every part of our lives, farming included. Most people who engage in farming in Sudan feel as though farming is the work that is left over when they have missed out on every other opportunity. But when the church brings the message that they are being called by God to be caretakers of the land and provide for their families and communities it is hard to describe just how much that understanding changes a person. When you understand a task as a calling from God, you look for and find the strength and love you need from God to do it. Your work becomes joyful, challenges become opportunities to rely on God, and the fruits of your labor multiply. I want to thank you each for your prayers and encouragement during my time in Sudan. I ask for your continued prayers for peace in Sudan, as armed conflict in the border region between north and south has been increasing in the last month. World Partnership Sunday will be on 8th May. Thank you all very much for your tremendous response to my request for old glasses which will go a long way to help the patients of St Luke’s Hospital in Malawi. These have all been cleaned and I have spent a number of afternoons in the Eye Department at our hospital checking the prescriptions of the glasses. By the time you read this all donations received before 24th March will be on their way to the Malawi hospital in a shipping container organised by the Diocese of Birmingham. At present (13th March) our living areas are full of medical kit which will go in the container. We received from GP practices throughout the county items that they no longer need and are gathering dust in stores. I have been given a steriliser, an ECG machine on a large stand, numerous BP kits and stethoscopes, nebulisers and assorted other goods, so St Luke’s Hospital should be able to improve their services which in some areas are at the level of medical practice when I qualified some 30+ years ago. I shall see how the equipment is being used in July when I visit them. Please keep donating the glasses as I will take them out in my luggage so you will not have missed the boat. I recently went to a talk about the Whiteway Colony near Stroud. It was founded in 1898 by anarchist followers of Tolstoyan Utopian ideals which had broken away from another Tolstoy community in Essex. Parkland of some forty acres was purchased along with seeds, tools, materials and provisions. Private property was shared and the deeds of the land were burnt at the end of a pitchfork! After initial problems the community prospered as more people were attracted by freedom from conventional standards to have a plot of land and build their own houses. A communal hall was built by residents in 1924 and a swimming pool and school in 1969. The colony is still in existence today, and residents are aware and proud of its origin. There is still communal use and maintenance of communal facilities and governance of the community continues to be done by general meeting of the residents. What I found interesting was that although one of the early trustees was a Quaker (who translated the World Classics edition of some of Tolstoy’s philosophical works), formal religion seemed to play no part in their daily life and the buildings did not include a specific place of worship. This did not mean there was no reaching out to those in need. It became a haven for immigrant anarchists, Conscientious Objectors and refugees from the Spanish Civil War. It was one of the first organisations to run camps for multi-national groups and to initiate co-operative ventures (such as Prothero’s Bakery). Co-incidentally at the same time I was reading an article in New Fire (a quarterly journal of the Society of Saint John the Evangelist, which sadly is no longer published) by Sister Aelred Mary on ‘Communities – Old and New’. In this she assesses the value of ‘alternative’ communities – communities which are concerned in working out a different form of life from the rather hectic, rat-race consumerism most of us endure as being part and parcel of First World society. As a Benedictine nun the society she describes is, of course, very different from Whiteway. It is, she records, a typical Benedictine balance of prayer and work, framed worship together in the chapel, interspersed with periods for work or relaxation. Although it is highly structured she sees it as allowing greater freedom than might be apparent. Discipline itself produces a measure of freedom, enhanced by spiritual freedom, space for God. She is aware that the future for such traditional communities is uncertain and thinks they should do well to look at ‘alternative’ communities and recognise that absolute certainty in a future is not necessarily a good thing. Although she was not considering communities like the Whiteway Colony nonetheless her conclusion that other forms of community have something to learn from each other remains valid and relevant to us. Then at Evening Prayer we were reading the letters of Timothy and the attempts by Paul to build a community of faith under difficult circumstances. Since even our community here in Prestbury is not immune from controversy, the Letters Paul wrote to Timothy are still pertinent and worth our study, if only to re-enforce the need for compassion, tolerance and prayer in our life together. The next event organised by the Friends of St Mary’s, on Friday 1st April at 7pm, is an illustrated talk: ‘Lawrence Johnston: The Creator of Hidcote’. The speaker, Graham Pearson, who is a volunteer with the National Trust at Hidcote, has written several books about Hidcote and its creator, Major Lawrence Johnston. He has also given many talks and lectures to various groups over the years. As Lord Aberconway, President of the RHS, said when presenting the Veitch Gold Medal to Lawrence ‘There has been no more beautiful formal garden laid out since the time of the old Palace of Versailles than that designed on quite a small scale, but with exquisite artistry, by Major Lawrence Johnston at Hidcote’. Following the talk, which is in St Mary’s Church, there will be a two course supper with a glass of wine. Tickets cost £10 each and are available from Jim Mackie, Phil Dodd or Gill Wood. The Annual Parochial Church Meeting follows the Annual Meeting of Parishioners, which takes place on Sunday 3rd April 2011 at St Nicolas’ Church at 6.30pm. This is a chance to come and hear a review and reports of what has taken place during the last year, together with plans for the future and an opportunity to ask questions. The APCM is where elections to the PCC take place. This year there will also be elections for representatives to the Deanery Synod. Nomination forms are displayed on the notice boards of both churches for two Sundays prior to the meeting. Candidates must be proposed and seconded by a person who is on the Electoral Roll of the parish and they should also be asked if they are willing to stand! There will be an open meeting in St Matthew’s Church on Tuesday 5th April at 7.30pm. The purpose of the meeting is to hear about and discuss the draft legislation on women bishops which will be voted on by Diocesan Synod in June. We have been asked to publicise this meeting widely as anyone who is interested is welcome to attend. The cobwebs are coming down! The cobwebs are being brushed from the ceiling at St Mary’s on Friday 8th April. Help will then be needed on Saturday 9th April from 10am to spring clean the church in the usual way. Refreshments provided. Do join us. The springtime churchyard tidy will also be taking place on Saturday 9th April from 10am. Any time that you can spare to help with these jobs will be greatly appreciated. Refreshments provided. On Tuesday 12th April the Mothers’ Union ‘Wave of Prayer’ takes place in St Mary’s Church from 8am to 9am. The next meeting of the Mothers’ Union is on Tuesday 26th April at St Nicolas’ Church at 7.30pm when Fr Paul Iles will be with us for Reflections for Easter. Everyone is very welcome. Ladies and Gents: Would you like a new wardrobe? Tired of the same old clothes? Want to bag some new looks? Then bring your clothes and accessories and see if you like someone else’s on the rail. Collect your cake and coffee and have a browse! One raffle ticket, in exchange for one of your items of clothing or one accessory, will get you one item of your choice. Any designer items you bring may get you more tickets, at the organiser’s discretion. Nothing to exchange? No problem, buy raffle tickets to purchase items! £1 entry fee on the door. Charities I am sponsoring: Prestbury and Pittville Youth (PPY) www.ppy.org.uk/; Margaret Beaufort Institute of Theology www.margaretbeaufort.cam.ac.uk/; ‘The Women’s Table’ a South African Charity founded to help support women in practical ways. Contact Sarah Gardiner at charityevents30@hotmail.co.uk for more information. Here we are in Lent and before we know it we shall be through Easter and into summer. Before the sun reaches its highest point and we all go off on our holidays there is the highlight of the Christian Aid Year. For one week we concentrate our energies on the House to House collection which raises thousands of pounds for the work of the charity. Over the years we have relied on many regular supporters who have delivered the envelopes and returned to collect the donations. Over the years these enthusiastic helpers move away or become unable to cover their area so that within the parish there are areas which are no longer collected and we need to recruit new and younger helpers. Are you fit and able to help? Please think about this carefully, it only requires one evening to deliver on average 25-30 envelopes and another to collect them later in the week. 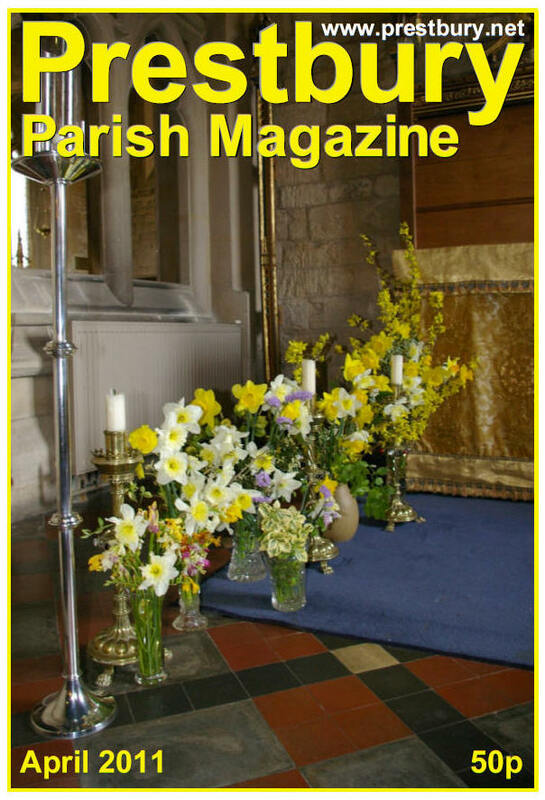 The money collected goes towards the many projects funded by Christian Aid an example of which is outlined in this edition of the parish magazine. Anyone can deliver the envelopes, but you have to be over sixteen years of age to collect them. Thank you to all who supported last month’s stall. We made £100, which has been sent to Care International where it will be quadrupled by the EU. Well done everybody! This month’s stall is on Sunday 17th April and we invite the G-M team to supply the cakes. If you would like to join our baking teams, please have a word with one of us. Join Jesus and his friends in their joyful walk to Jerusalem amid the cheering crowds. We will meet at St Nicolas’ Church, Swindon Lane, to start our service at 9.30am and will then walk down New Barn Lane to Capel Court in the Burgage for the Liturgy of the Palms. Those who want a shorter walk can join us there at 10.00am. We will then go on to St Mary’s Church where there will be refreshments waiting and, after a short break, the service will continue at 11.00am for all who wish to stay. This part of the service will incorporate the dramatic reading of what happened after they all arrived in Jerusalem and will end with the sharing of the Eucharist – the special meal in which we receive Jesus’ offering of himself for the world. Please invite your friends, come along, and pray for lovely weather! Crucifixion breathes life into a story that everybody knows. What is striking is the sheer power of the original medieval poetry – Jesus challenging the audience from the cross to acknowledge that he is suffering for them, and the poignant pain and anguish of Mary’s lament for her dying child. These are not the characters preserved in the cold marble of a pieta or elegant stained glass window, but living, suffering human beings. We hope you may find it a suitable end to Lent or beginning to Easter. We know you will find it a moving and memorable theatrical experience. There is a walk planned for Saturday 18th June on part of the Cotswold Way to raise money for the above. You can walk from two to twenty four miles and the cost to enter is £10.00 per adult, £12.00 for a family. If you do the walk they are offering a 50% reduction on a three-hour Basic Life Saving Skills course which is normally £33.00. Twelve people required for a course. Overall not a huge saving but perhaps an encouragement. You can of course pay the full amount and not take part in the walk. Thank you everybody who came to the Charity Quiz night, I think you’ll agree a fantastic atmosphere! In total for the three charities £66.38 was raised. This is not including the ‘fill a jar’ which is still running, so a fantastic contribution. If you would like a jar to fill with change or notes (!) contact me at charityevents30@hotmail.co.uk or at my address. Thank you to all who helped set up and helped with refreshments, a big thanks to Andy and David once again and to all of you who cleared away unprompted so swiftly, it was a big help! A very big thank you to Jackie Moles and the car-parking team and ‘sunbathers’ (afternoon security guards) and to Sue Bolton and the refreshments team. The parking raised £2,952 and the refreshments £224. So altogether a grand total of £3,176 for church funds this year. Thank you also to Fr Mike French, who was at St Nicolas’ early each day and chatted with the visitors.